Chocolate Easter Bunnies: Hollow or Solid? No Contest. Since the dawn of time (or at least for the last 30 years) we have pondered the epic question: hollow chocolate Easter bunny versus solid chocolate Easter bunny? In fact, the New York Times dedicated a long article to analyzing the origins, purpose, and merits of hollow chocolate Easter bunnies in 1989. Smithsonian Magazine revived the topic 19 years later with an awesome look at history and the leading American hollow chocolate bunny maker, R.M. Palmer — a company that lays claim to having the most "versatile molding line in the world." Chocolate and anything is more fun to eat when gamified. And the risk of a chocolate bunny collapsing if bitten in just the wrong way makes the eating experience more rewarding. In fact, I'd wager the success of Snickers, the top candy brand, has a lot to do with its layered, coated design which offers oh so many possibilities for dissecting. Sure, you can get a chocolate mold and form a hollow chocolate bunny. I'm willing to bet that the success factor, vs solid bunnies, might parallel the success rate of local bands trying to become famous. Hollow holiday chocolates require a lot more skill, patience, and practice. Not that eating your rejects is a bad thing. Or even gifting them as "outsider chocolate art." Perhaps that's why there are so few hollow bunny makers around. Maybe not as daring or thrilling as skydiving or eating the potentially life-ending Fugu in Japan. But having packed, and smashed or melted multiple bunnies and Santa Clauses in my luggage on the way back from Germany, I feel confident in stating that the skill required to get a hollow bunny home or to a gift recipient without breaking or melting builds upon that gamification point. Triumph of winning over fate! "If you had a larger-size bunny and it was solid chocolate, it would be like a brick; you’d be breaking teeth." I say if you've ever had a large, solid chocolate bunny, you already know what I'm going to say: It's all in the technique of shaving the bunny down with your teeth. We will not be deterred by bunny size or mass! Bring 'em on. R.M. Palmer's Easter candy website includes a fascinating timeline of chocolate bunny manufacturing history, beginning with the tradition's German origins. See's Candies makes foil-wrapped milk and dark chocolate bunnies in tall and short versions. Basically the perfect excuse to set up a little family scene before devouring. Want more? Check out Candy Blog's investigation into American chocolate bunnies. Or be the change and start your own foil-wrapped chocolate business. You can start making molded holiday chocolates yourself (or 3D print the chocolates!) and wrap them by hand with confection foil. Or if you have a commercial idea and want to get started big time, consider a co-packer, or contract manufacturer. Finding the right co-packer can be difficult. But aspiring chocolate entrepreneurs who prefer to brand and market a line of chocolate rather than make it are in LUCK. Their private label service allows entrepreneurs to brand existing candy and chocolate products they make, with your company design and name. 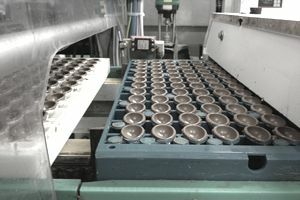 Their co-packing service, which is another way of saying contract manufacturing, gives companies and solo entrepreneur the chance to create unique molded chocolate products and other candies based on your vision for a unique product line. Needless to say, co-packing is much more expensive than private labeling an existing product line. Birnn Chocolates of Vermont is also a member of the Specialty Food Association. This company specializes in chocolate truffles and also offers foil-wrapped options. Can I sample the chocolate you would use? Do I have a choice of chocolate? What are molding and wrapping options? Can you provide some customer references? You'll find a lot more questions and guidance for working with co-packers in Good Food, Great Business or online at various university sites. A shortcut to finding the perfect co-packing partner often starts with asking someone who has created a line similar to the one you're envisioning. Preferably over a box of chocolate.